It was Homecoming Weekend in 2000, and Ray Thrasher had just participated in the dedication of the newly completed Waggoner Library. In many ways, the morning ceremony was symbolic of Ray’s dedication and tenacity. All those years of work had led to this moment, and it seemed right to simply soak it in. In the picture, she stands beaming on the front steps of Waggoner Library, a red blazer atop her dress, presumably to ward off any cool breezes that might blow through on that early fall morning. Maybe that’s why, after all the years and the memories, it’s the accomplishment she’s yet to forget. You don’t become a campus legend like Ray Thrasher without a story. 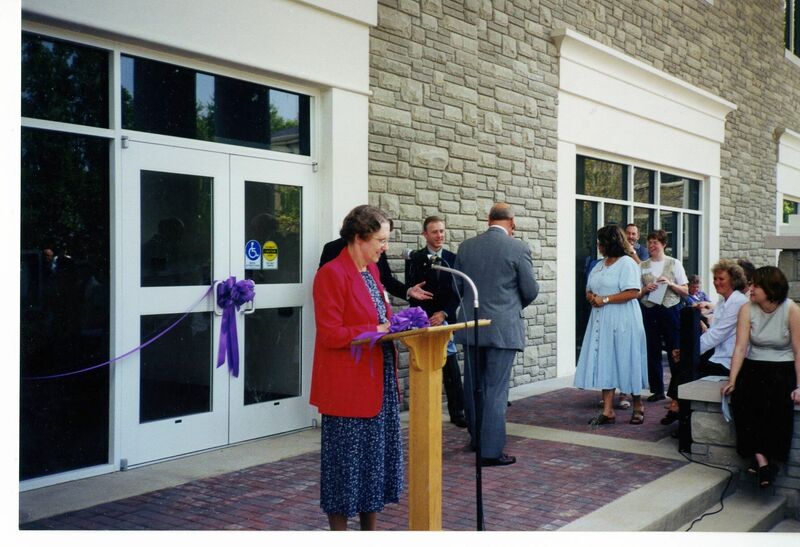 Before Ray was the dedicated librarian, the champion whose tenacity resulted in Waggoner Library becoming a reality or even “the Squirrel Lady,” she was simply E. Ray Kohser, a Trevecca student. The oldest of three sisters and the daughter of a Nazarene pastor, Ray was born in her grandmother’s house on Squirrel Hill outside Pittsburgh, Pa., something step-daughter Jeanne Thrasher Sugg (’65), reflects on with a laugh. Ray arrived at Trevecca as a freshman in the fall of 1959. With the exception of a few months teaching at a private school in Alabama, she would spend the next 60 years on the campus, both as an employee and one of the University’s most loyal supporters. University records paint a picture of Ray as an active student, serving as the photographer of the University’s student newspaper, the TrevEchoes, her junior year and the business manager as a senior. The 1964 graduate sang in the choir, served as a student worker in the library—then housed in the Mackey Building—and earned a TNU Merit Award for sportsmanship at the close of her junior year. After graduation and her brief stint teaching in Alabama, Ray returned to Nashville and Trevecca. She enrolled at Peabody College, pursuing a master’s degree in library science, and began working at as a technical services librarian in Trevecca’s Mackey Library. “A technical services librarian orders books and processes them and makes sure they get out on the shelf,” explains Jeanne, a librarian herself. 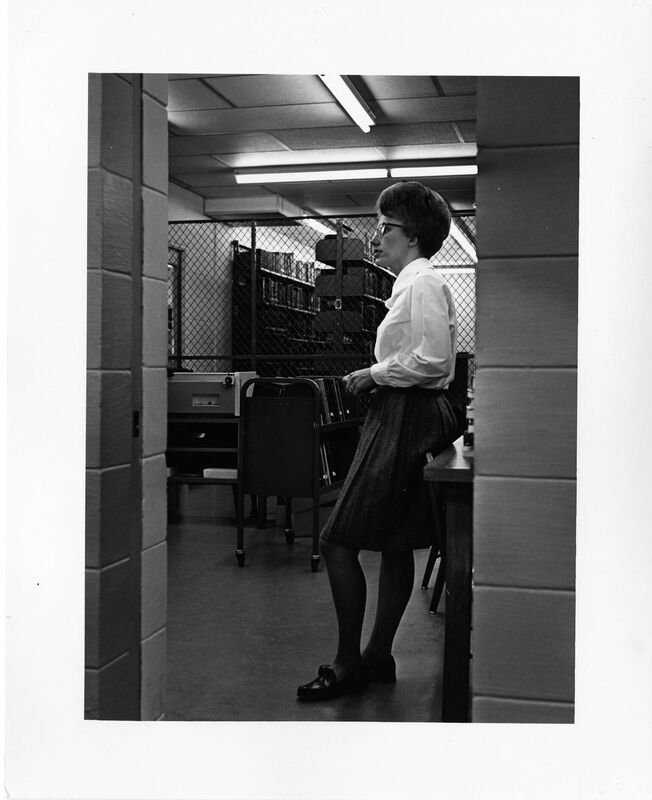 By 1966, Ray had become a full-time librarian at then Trevecca College, working under the leadership of Lyla Mackey, the wife of former Trevecca president A.B. Mackey. It was through this relationship that Thrasher would meet C.R. Thrasher, Lyla Mackey’s brother and a retired Church of the Nazarene pastor and district superintendent. After a tragic car accident in 1967 that made him a widower, C.R. retired from the ministry and moved to Trevecca Towers, which allowed him to be closer to his sister. He served as an assistant pastor at then College Hill Church of the Nazarene—now Trevecca Community Church—and a chaplain at Trevecca Towers. Ray and C.R. married in 1969, continuing to live at Trevecca Towers. Apartment 1408 remained Ray’s home even after the death of her husband in 2005, until she moved to an assisted living and memory care facility in Hermitage, Tenn., earlier this year. In 1984, Ray was named director of library services at Trevecca, after serving under Mackey and Johnny J. Wheelbarger. Prilla Speer, who worked with Ray in the library for a number of years, recalls her as a determined, dedicated librarian who fought to ensure Trevecca’s library was a top-of-the-line resource for students. Under Ray’s leadership, Mackey Library staff took important steps to give students access—physically as well as virtually—to a vast number of library collections and holdings, both public and collegiate. As technology began to transform the way students accessed information, Ray and her library staff worked to ensure students had the resources they needed. Speer was fresh out of college when she began working at Mackey Library and says Ray helped her to better understand what it meant to be a professional librarian. A member of a number of professional organizations, including the Tennessee Library Association and American Library Association, Ray would often bring Speer along to professional meetings and conferences. For most of Ray’s tenure at Trevecca, the library had been located in the Mackey Building. As Ray saw other universities building new libraries better designed to meet the technological research needs of modern students, she became convinced Trevecca needed to do more than renovate the library. 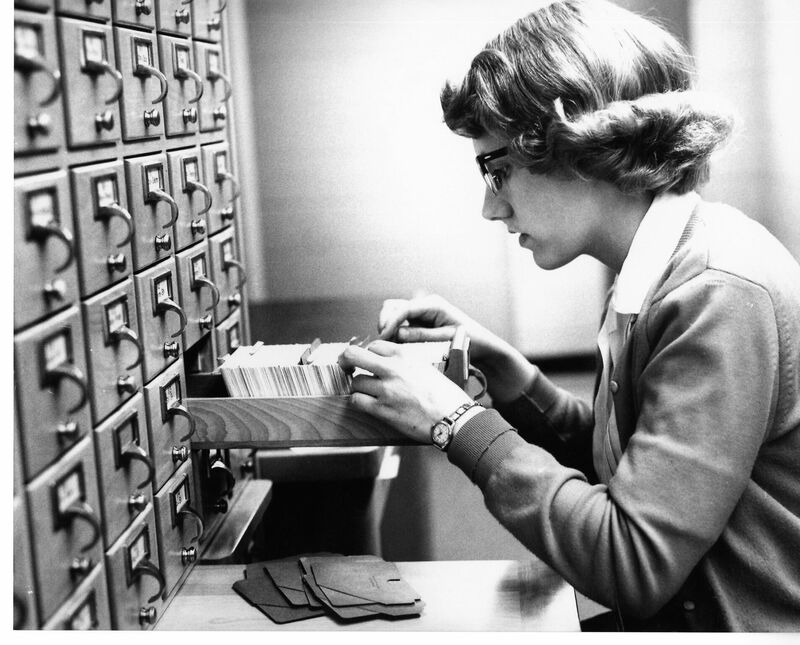 Ray had been convinced of the need earlier, but now she had the data necessary to support her position. And support it she did, working with consultants, taking members of the President’s Cabinet and other officials to visit area libraries and continually bringing her case before then Trevecca President Millard Reed. For more than a decade, Ray passionately championed the need for a new library, urging Trevecca leaders to give it top priority among several campus projects outlined in the University’s long-term development plan. Ray’s passionate persistence paid off. In April 1999, the University broke ground on Waggoner Library, made possible by a generous gift from Don and Zelma Waggoner. The building was completed on schedule and dedicated during Homecoming Weekend, 2000. Ray continued to serve as the library director until 2001, when she stepped down to spend more time with C.R., whose health was failing. She worked as a technical services librarian until her retirement in 2009. In recognition for her years of service, Trevecca’s Board of Trustees awarded Ray emeritus status. For nearly a decade after her retirement, Ray continued to live in her Trevecca Towers apartment, only recently moving away from the Hill. She walked the campus every morning and fed the squirrels, a tradition she’d begun in the Mackey Library days, cranking open the windows to her office and sprinkling peanuts from a five-pound bag she kept in her office. A lifelong sports fan, Ray attended as many Trevecca games as she could, usually wearing purple. She’d visit the coaches and sometimes pray with teams on the buses before they left on trips. Her dedication hasn’t gone unnoticed. A volleyball scholarship has been created in her honor. 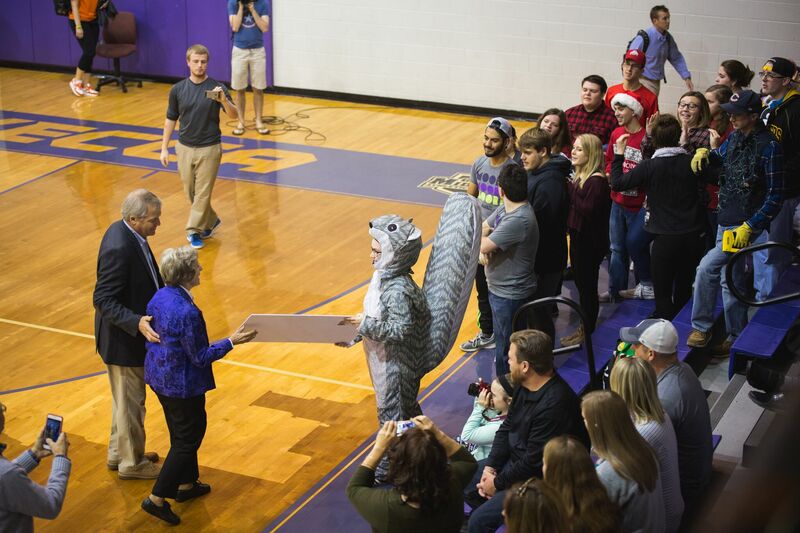 Last winter, students, athletes and fans alike celebrated Ray during a men’s basketball game, thanking her for her dedication to Trevecca sports. A devoted grandmother, Ray was deeply proud of her grandchildren. Her grandson, James Sugg recalled that pride in a letter he wrote honoring Ray upon her retirement. In May, Ray moved away from Trevecca’s campus for the first time in 49 years, and her absence has given the campus community time to reflect on her legacy. Waggoner Library, of course, figures prominently into that, but Ray’s legacy goes even deeper. It’s the story of a woman who found a home here, and, in return, gave every bit of herself back to Trevecca. It’s a legacy of devotion, passion, tenacity and perseverance. And, above all, love.